Eton 41.5cc Ignition Coil is now Black thunder Ikeda coil green o.e.m. p/n 700169 is now forever discontinued!!! Buy our Black Thunder coil and save $100's and solve 5 problems all with one part! SUPERIOR! type 1 heavy duty & fantastic Black Thunder racing coil will save you needing to replace related ignition trigger module and govenor and flywheel and other crankcase or crankshaft damage from exploding flywheels. H.D. Black Thunder coils now available for replacement of the green o.e.m. coil which is problematic at best and now Forever discontinued as minimum reorder is well over $20,000 With this new coil you will not have the ability to electronically govern the engine but the reliability is outstanding. 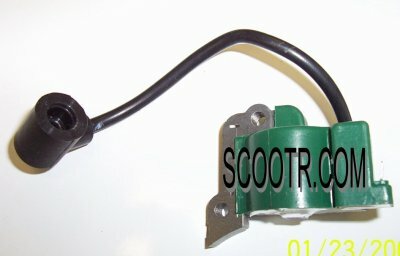 go to www.YouTube.com and search for SCOOTR.com OR hsing hua 172197 our videos on these New Black Thunder coils will explain everything.